Not all Auburn dental emergencies can be avoided despite best efforts. When you experience an unavoidable emergency, your friendly Grafton and Auburn emergency dentist and dental care team are here to help. There are a few ways you can reduce your risk for dental emergencies. In this post, we’ll review some of the ways you can limit your risk for an emergency. The easiest, and perhaps most obvious, way to avoid dental emergencies is to carefully complete your at-home hygiene routine each day. You should brush teeth for at least two minutes at a time at least two times each day. 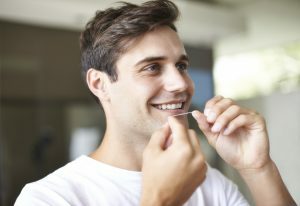 You should also floss your teeth at least once each day. In addition to your basic at-home hygiene, you should also visit our office twice each year for a dental exam and professional teeth cleanings. During these appointments, we’ll evaluate your smile for early warning signs of common oral health concerns and help you avoid tooth decay or damage. We will also be able to diagnosis other oral health concerns in the earliest stages to provide more conservative treatments. If you play a sport where your smile may come in contact with other players, sports equipment, or hard surfaces, you should always wear a sportsguard to protect your teeth. Custom appliances from our office are much more comfortable than store bought mouthguards and they provide superior protection for athletes of all ages. If you experience unconscious teeth grinding and clenching, you should consistently wear a nightguard to avoid damage that can occur when teeth are repeatedly grinded together. These guards place a physical barrier between the rows of teeth, protecting smiles from damage. Experienced Grafton emergency dentist, Joe Kern, DDS, is happy to help patients who are suffering through dental emergencies. In many cases, the Kern Family Dentistry team can see you on the same day you experience the emergency. We’ll get started immediately, helping relieve your pain and start renewing your damaged smile right away. If you need our help during a dental emergency, call our team. We’ll walk you through first aid over the phone and help you reach our office safely for additional treatment. Located in Grafton, we are just a short drive for patients in Auburn, and we’re here to help if you need us during an emergency.